OTB Consulting received the top award for our market segment at the LexisNexis Annual Certified Independent Consultant Conference held in Cary, North Carolina in October. The award is a reflection of our clients’ understanding of the value Time Matters and other LexisNexis Practice Management products deliver. 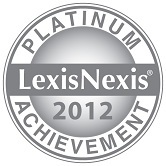 OTB Consulting received one of the top awards at the LexisNexis Practice Management Annual Conference held in Las Vegas September 13 and 14, 2010. OTB was recognized for the Top Time Matters Sales for the previous year. This award is a result of the hard work by many of our staff, but also the LexisNexis sales team – a dedicated group of professionals we are proud to work with, and our clients who understand the value of Time Matters and the other LexisNexis Practice Management products. It also reflects the growth and excitement we are experiencing with our expanding BKexpress clientele. “This past year we have seen incredible growth with our BKexpress consumer bankruptcy system. As more and more law firms discover the returns it can provide them, we are adding new users at a record rate. Because the underlying engine of BKexpress is Time Matters, our growth greatly contributed to this award that we were proud to receive from our partner, LexisNexis,” said Tom Rowe, Managing Director of OTB. OTB Consulting received two awards at the LexisNexis Practice Management Annual Conference held last month in Dallas, Texas. OTB was recognized as the Top Consulting Firm and for Overall Top Sales. The Top Consulting Firm award recognized OTB for their contributions to the LexisNexis Practice Management community, as well as to the Certified Independent Consulting (CIC) Community. Although awarded by LexisNexis, OTB is particularly proud that this award was voted on by our peers and colleagues – the entire CIC community. “It is one of our company’s core goals to proactively and positively contribute to the legal practice management community. We believe that “a rising tide floats all boats” and if our CIC community excels so does the entire industry to everyone’s benefit. We’ve been contributing our innovative products, services, methodologies and knowledge to our colleagues for years, and we are honored that they have seen value in what we have shared,” said Tom Rowe, Managing Director. The Overall Sales award is a result of the hard work by many of our staff, but also the LexisNexis sales team, and our clients who understand the value of Time Matters and the other LexisNexis Practice Management products. We thank all the OTB users who got out the TechnoLawyer @ Award vote. Over 10,000 experts and everyday users that make up the TechnoLawyer online community voted the OTB Personal Injury Practice Template as the Best Practice Area Solution.